During my two visits to Tokyo, I’ve enjoyed Switch Coffee Tokyo’s coffee in both About Life Coffee Brewers, where you’ll find a pair of single-origins available as either espresso or pour-over, and Nem Coffee & Espresso, whose bespoke house-blend is roasted by Switch. However, since I’ve not yet made it down to Switch’s coffee shop/roastery in Meguro, I was delighted when the baristas at Little Nap Coffee Stand told me that Switch had opened a second branch opposite Yoyogi-Hachiman station, a mere five minutes’ walk away. There’s not a lot to the new branch of Switch, with just the stool outside providing the only seat. Inside, it is standing-room only, with a choice of drinks from a concise espresso menu (espresso, latte or cappuccino) using Switch’s seasonal espresso blend, or batch-brew with a regularly-changing single-origin. You can also buy retail bags of beans to take home with you. There’s an interesting cluster of specialty coffee shops just to the west of Yoyogi Park in the north-eastern reaches of Shibuya. 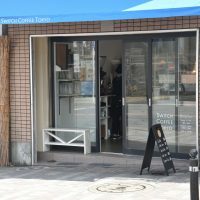 Joining the original trend-setters Little Nap Coffee Stand (which now also has a coffee shop/roastery in the area) and Fuglen Tokyo, are the likes of Coffee Supreme Tokyo and today’s Coffee Spot, the second branch of Switch Coffee Tokyo. Directly opposite the Yoyogi-Hachiman station, it’s easy enough to get to by public transport and can be fun if you like sitting on the solitary bench and watching the trains go by, with both commuter and long-distance services passing through. However, there’s not very much to Switch, so it’s never going to be a major coffee destination. Perhaps twice as wide as it is deep, the store is glass-fronted, set back slightly from the street, providing just enough room for the aforementioned bench, with an awning providing shade. The door is to the left, although it looks as if the entire front can be pulled to one side, concertina-style, making the whole shop open to the street. Inside, the layout is simple, the space not allowing for much else. There’s a counter at the back, a few paces from the window, with a cabinet, more a piece of furniture than anything else, on the right-hand wall, a mirror above that. To the left, there’s a small retail selection and that’s about it. The counter is wide enough for the till and a flask of the batch-brew on the left, while the two-group La Marzocco Linea espresso machine and its Mythos One grinder is on the right. Finally, along a shelf on the left-hand wall, behind the counter, you’ll find at EK43 grinder for the batch-brewer, which is a little further on. And that’s it. The batch-brew option was a washed Honduras single-origin, but I wanted to try Switch’s seasonal blend, 50% El Salvador, 50% Brazil, as an espresso. It was a little acidic, with very much a front-of-the-mouth feel, but otherwise very well-balanced. Suitably recharged, I went on my way. October 2018: I’ve written up my visit to Swtich’s roastery/coffee shop in Meguro, which I visited later on during the same trip in July 2018. If you enjoyed this Coffee Spot, then take a look at the rest of Tokyo’s speciality coffee scene with the Coffee Spot Guide to Tokyo. This entry was posted in Cafe/Roaster, Coffee Shops, Evening Opening, Retailers, Saturday Short, Stations Nearby, Tokyo and tagged include, Switch, Tokyo2018 by Brian Williams. Bookmark the permalink.